What is a beer flight? Where do you begin when tasting craft beer, and which beer should you try first? If you’re new to craft beer, you probably have many of the same questions. Unlike knocking back a few normal lagers with friends after work, there are more things to consider before you start sipping on your next pour of craft beer. Drinking craft beer follows its own set of rules. 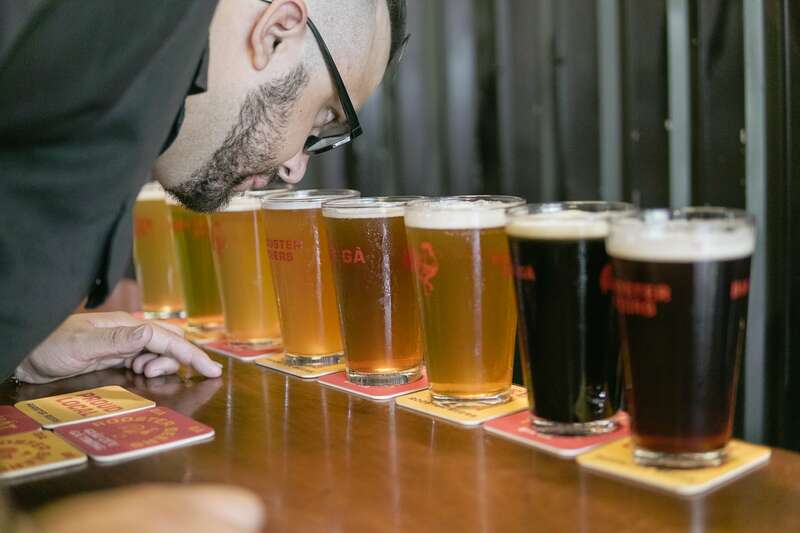 Read through our guide to getting through a beer flight for the best experience. To help you feel a bit more confident we put together the ultimate beginner’s guide to drinking craft beer. Before we could do that, we teamed up with Vietnam Craft Bia to make sure everyone knows how to work through their first “craft beer flight”. 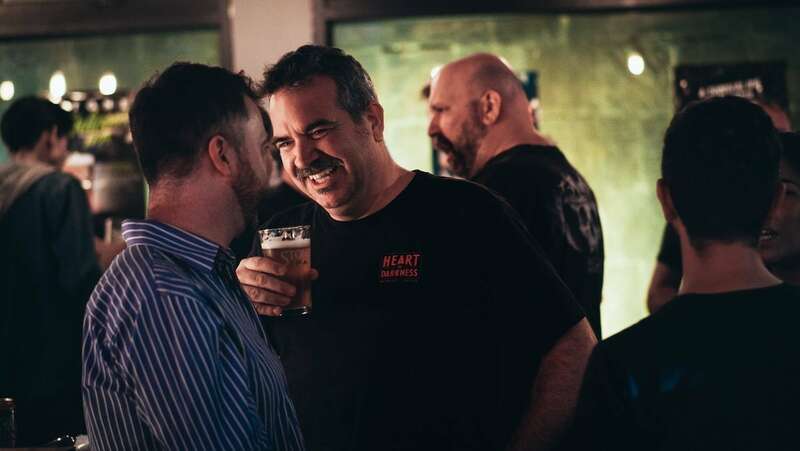 Alongside sharing encyclopedic knowledge of everything craft, the Vietnam-based beer collective took a step back to view craft beer from the perspective of a genuine beginner. 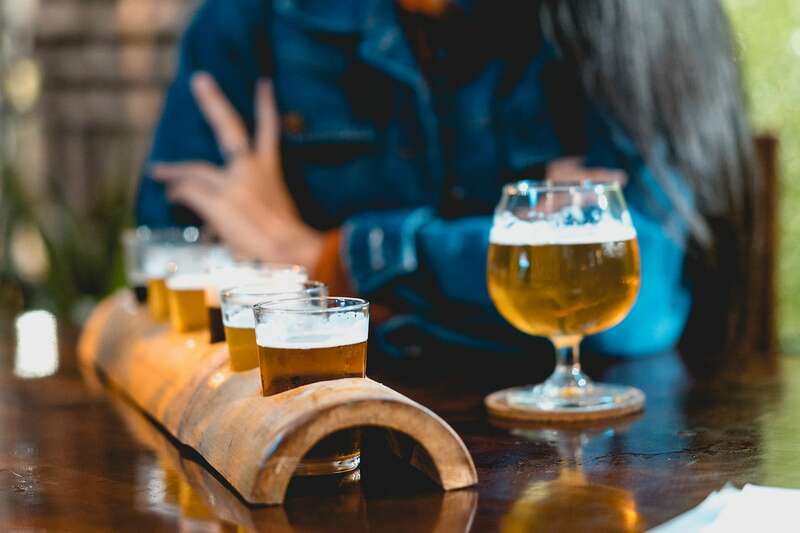 Although the country’s microbrewing culture offers a never ending number of options to choose from, you’d be surprised to learn that tasting craft beer often follows a specific order and progression, especially for new craft beer drinkers. A craft beer flight consists of a series of beers, perfect for sampling and honing your taste buds to different beer flavors. Added is the importance of knowing how strong your beer is, what to order, and what to do when the bartender comes back with four beers at the same time. No, this isn’t a mistake. This is what we call a craft beer flight. What is a craft beer flight? In its most simple form, a beer flight is four small glasses of craft beer served simultaneously on a wooden or steel plank. If you are new to craft beer our experts suggest starting with the smallest size offered. But why four beers at the same time? Just like a car, you should test it out before you buy it. Craft beer styles vary in taste, aroma, and strength so don’t expect to like everything. Beer flights are the best way for customers to sample large amounts of craft beer styles in one session. Your flight of beer can be consumed individually or shared in small groups depending on the size and amount of beer in each glass. 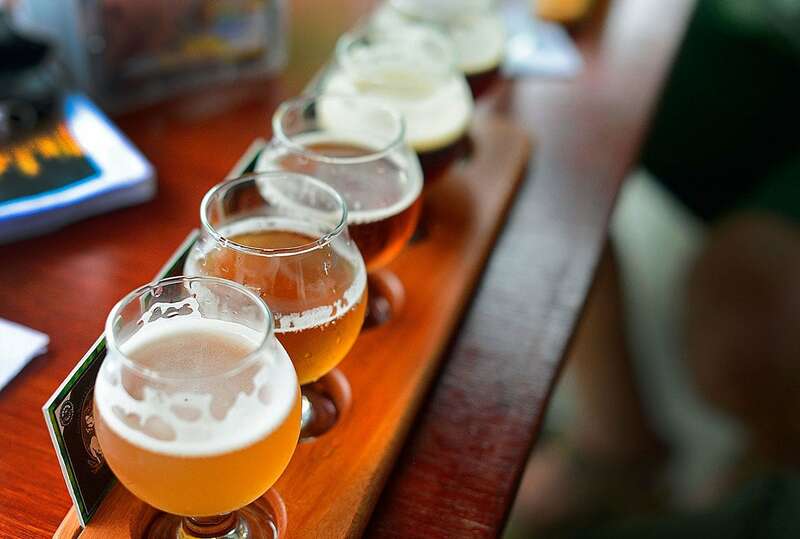 Craft beers in a flight vary in taste, aroma, and alcohol by volume strength. Craft beer taster flights are a regular part of drinking culture and make for the perfect opportunity to discover which styles you like and dislike. Order as many different kinds of beer as you can. Share with your friends, swap flights, and see what other people in your group are drinking. Which craft beers should I order first? If you have never tried craft beer before, we highly-recommend going with a friend that can order the first round for you. If you end up taking on the challenge by yourself, cozy up next to the bartender and pick their brains for suggestions on what to try first. If you are new to craft we recommend ordering the smallest flight first. Make a note that craft beer can be strong. 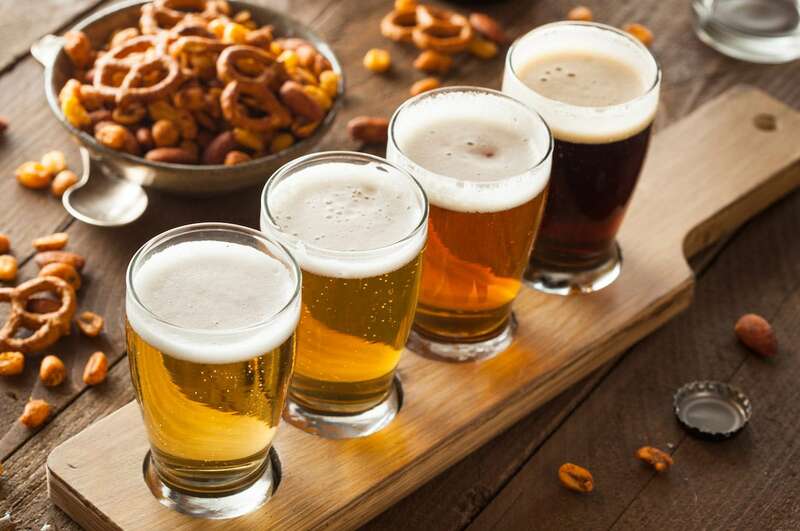 While most mainstream lagers like Budweiser or Heineken ring in at about 5% alcohol by volume, it’s not uncommon to find craft beers on the menu well above 10% ABV. For beginners it’s best to avoid potent beers until you get the hang of things. Drink slowly and be sure to eat before you start drinking, and drink water in between each beer. Start with lighter styles like golden ales, pilsners, pale ales, or blonde ales. Save dark and hoppy kinds of beer—like porters, IPAs, and stouts for later. Ease your way up to heavy, high ABV brews. How do I drink a beer flight? Aside from avoiding beer with above average ABV, drinkers should make sure to order four different styles of craft beer for their flight. They will be served in order, from light to heavy, moving inward from left to right. Flights are normally ordered according to beer strength. In between each glass our experts suggest taking a full sip of water. This will act as a palate cleanser and clean all the residual taste out before you try the next style. If no water is consumed between beers, the taste profiles may overlap resulting in tarnished flavors. Don’t take baby sips. Take a big gulp and swish the beer around in your mouth. This allows you to pick up on all of the taste profiles of the beer. This isn’t wine, but don’t be shy! If you’re drinking craft beer in Ho Chi MInh City there’s no need to ask your bartender because we’ve already put together a beer flight just for you. If you’re feeling good after you sample our first suggested flight, move onto the second and see if you can manage a few of Vietnam’s more serious brews. Remember: Begin with the beer on your far left side. After beer one, start working your way inwards to the right. Do not skip any beers, and make sure to follow the order carefully. Take one sip of water in between each beer. Moving left to right: The White Ale from Tê Tê Craft Beer (5.5% ABV), Platinum’s Golden Ale (4.6% ABV), Pasteur Street Brewing Company’s Passion Fruit Wheat Ale (4% ABV), and finally the Dream Alone Pale Ale from Heart of Darkness Brewery (5.7% ABV). Moving left to right: BiaCraft Artisan Ales’ Tram Phan Tram Crush Ale (4.4% ABV), Rooster Beers’ Blonde Ale (5.5% ABV), LAC Brewing Co’s Mango IPA (5.8% ABV), and finally the Coffee Vanilla Porter (7% ABV) from East West Brewing Co.